At Christmas, many of us feel overwhelmed by the influx of inanimate objects - but for a minority, compulsive hoarding is a serious problem that takes over a person's life as well as their home. 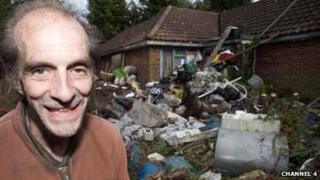 So why are television viewers fascinated by compulsive hoarding disorder? Channel 4's Obsessive Compulsive Hoarder this week is the latest small screen offering detailing the devastating consequences of the compulsive hoarding condition. The documentary focused on Richard Wallace, whose 30-year hoarding habit has prevented him from having a bath and a single night's sleep in his bed for years. "It's getting a bit silly now," he admits, and yet he appears to be unable to stop the compulsion to hoard. It's a pattern of behaviour with which television viewers are familiar. Previously, they followed the story of Edmund Trebus, the Polish-born, compulsive hoarding war veteran, whose battle with his local council in north London for his endless rubbish collection made him the most memorable star of BBC One's A Life of Grime series in 1999. Across the Atlantic, the television coverage for hoarding seems to be bigger and brassier. American documentary series Hoarders, which introduces interventions into sufferers' lives, started in 2009 and is now in its fourth season. Hoarding: Buried Alive, another documentary series that launched in the US last year, has faced accusations of exploiting this debilitating condition for entertainment value. Titles for individual episodes include This is Where You Sleep? ?, It's A Freaking War Zone, and Is That a Goat? Hoarding might often be thought of as an amusing quirk, a regular bone of contention between couples or a familiar did-you-see-that-documentary-last-night conversation in the office. But compulsive hoarding can dramatically reduce the quality of life for those affected by it and can even result in death since sufferers have been known to be crushed by their clutter. And yet hoarding in its most extreme form seems to engage television viewers - perhaps because many people have at least some tendency to hoard themselves. Moreover, watching compulsive hoarders may make spectators feel fortunate that a parent, a partner or even themselves do not suffer such acute symptoms. Clinical psychologist Dr Simon Rego at the Montefiore Medical Center, New York, who specialises in anxiety disorders including hoarding, believes such programmes are both a blessing and a curse. "The positives are that they shed light on a condition that affects a lot more people than you think, which can lead to an understanding, and eventually, better treatments for the sufferers," he says. "On the negative side, what we see is certainly some of the most extreme examples with hours of footage edited down to draw the audience in like any other entertainment show. So ultimately, viewers don't get the full picture of what can go on with this condition." But how does an inclination to hold on to things develop into compulsive hoarding disorder? As with a lot of psychological conditions, Dr Rego believes the causes are many and varied. "It's a combination of genetics, environmental, biological and psychological processes. For some, there is an acute stress trigger that causes the hoarding to start and once it takes hold, it builds up into a bigger and bigger problem. "There is a higher likelihood to be a hoarder if it's in the family. We might pick up the condition by learning it's important to keep things just in case from observing a family member who does exactly that." An example of this very tendency is Rachel Goacher, 19, an advertising student from Leeds, who acknowledges that she appears to be following in her father's footsteps when it comes to hoarding. Goacher admits she has hoarded all her life and has always had an attachment to objects. She insists she keeps everything in boxes because she wants to make scrap books containing her mementos, although she hasn't got around to doing it yet. "My dad is exactly the same," she says. "He still has boxes in our house that he hasn't unpacked since we moved here 15 years ago but claims it's stuff he needs. I keep things, like ribbons and boxes, because they might come in handy. "I've run out of space for any more storage solutions. The clutter doesn't really bring me down. I get fed up when everyone else comments. I like being surrounded by things. It's quite homely and my personality shines through all my possessions." For all that such behaviour seems extreme, some believe such behaviour is merely at the furthest end of a spectrum comprising most of the Western world. It is the hoarders' need to own more possessions that our society thrives upon - a process encouraged by successive British governments, according to psychologist Oliver James, author of Affluenza. "We place too high a value on money, possessions and appearances," he says. "Hoarding can be pathologised as a sickness of a minority but the vast majority of people are forever buying things they don't need and are then reluctant to throw it away," he says. "Meanwhile, the substantial increase in private storage companies is not helping this very real problem." Whichever way you look at it, hoarding, in its various forms, is a modern affliction that's not going anywhere.